Round 3 of the 2016 MRF Challenge concluded yesterday at the Buddh International Circuit in Greater Noida after four races. 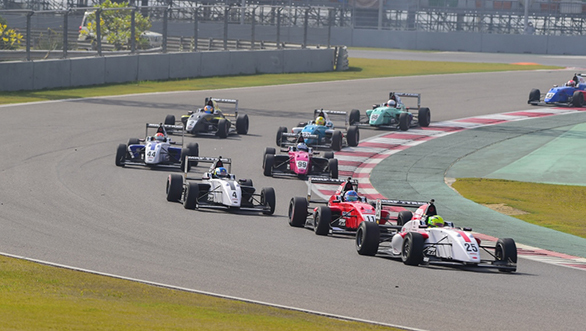 The weekend also held the first round of the 2017 MRF 1600 Championship, which comprised two races. For the first MRF Challenge race, Mick Schumacher secured his first pole in this year's championship, after a close battle with Harrison Newey. In the race, Schumacher got a good start and managed to hold the lead till the chequered flag. Felipe Drugovich, who overtook Harrison Newey in the first lap, finished in second place ahead of him. Championship leader, Joey Mawson, managed to finish fourth. In Race 2, Yoshiaki Katayama started from pole position on a reverse grid, while Kimi Schramm started from P2. In the first lap, Pavan Ravishankar collided with Drugovich which brought out the Safety Car. Once the race resumed, Mawson found his opportunity to get past Schramm, who was leading, and managed to pull away from the pack to take his second win of the season. Ralf Aron finished in second, almost eight seconds behind, while Schumacher took third. Schumacher took his second win this round in Race 3 ahead of Mawson and Newey. He got a good start from pole position while Newey, who started from P2, lost his place to Mawson. Although he did manage to get past him on the main straight, Mawson took back his position by C4. Schumacher's luck ran out in Race 4. Mawson and he were initially fighting for second place behind Aron. However, both of them collided, pushing Mawson to eighth. While Schumacher was trying to get past Aron, he clipped Drugovich in C4, forcing both of them to retire from the race. This resulted in the race ending with Safety Car still out. Newey stood first, while Aron and Mawson took second and third, respectively. After this round Mawson, extended his lead in the championship with 211 points. In the first MRF 1600 race this year, Ananth Shanmugam got pole position, had a bad start which pushed him to third place, behind Anindith Reddy and Nayan Chatterjee. However, he managed to get past both of them by the end of the race, to take the win. Reddy took second place, while Chatterjee took third. In Race 2, Alex Bora, who started from P1 on a reverse grid, was overtaken by Chatterjee by the end of Lap 1. Reddy passed Bora too, and in Lap 4, he even managed to take the lead. But with three laps left, Chatterjee regained first place and held it till the end, while Reddy and Shanmugam took second and third. The next round of the MRF 1600 Championship will be held along with the final round of the 2016 MRF Challenge, at the MMRT from February 17-19.